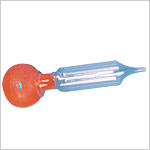 Asepto Bulb Syringes, known as Irrigating Syringes also, are designed to fit direct into the large lumen tubing. Asepto Syringes, as produced by GPC, have a capacity of 50 ml and 100 ml. Send Your Buy Requirement For "Asepto Syringe" AND Get Quote Quickly.